I whipped up a quick birthday card for a lady who once showed an appreciation to my cards when she saw them on my gallery and sent me a birthday card last year. I met her online 3mos ago and I jotted down her birthday so I can remember to send her a card as well. 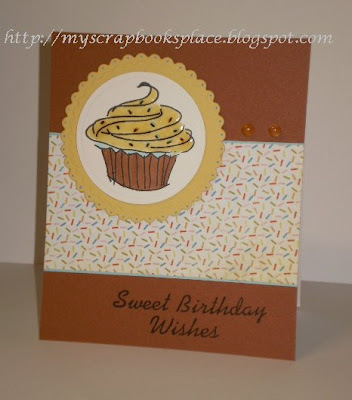 I used my Inkadinkado Cupcake Birthday stamps set for this card. The photo below was taken without flash. 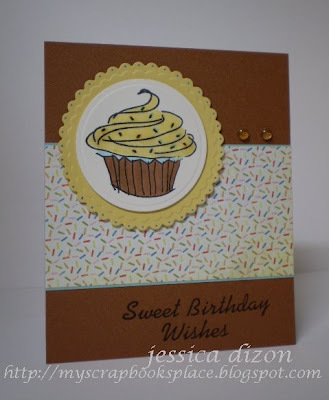 Patterned paper is from Basic Grey Cupcake pad, SU! So Saffron cs and various cs from my stash. I will be sending this card to the recipient tomorrow so hopefully it will arrive there in time for her birthday which will be on January 25. Jhet this is super cute! *hugs* Hope you are well!! This is really cute... I realised that I have these stamps, maybe I should get busy!